Exploring Rome has never been so easy! Discover the wonders of one of the world's great cities from the comfort of an open-air bus with the flexibility to get off whenever you would like. Choose 24-, 48-, or 72-hour tickets or our combo tickets with skip-the-line access to the Vatican and/or Colosseum. Book from home and save time! Onboard the Hop-On Hop-Off bus, you'll find an interesting commentary which will provide you with information about everything around you. Bus Line A gives you the opportunity to explore the biggest sights in Rome, like the Colosseum, the Vatican City and the Trevi Fountain. If you wish to discover something more, get off whenever you want and as many times as you want and continue on foot. 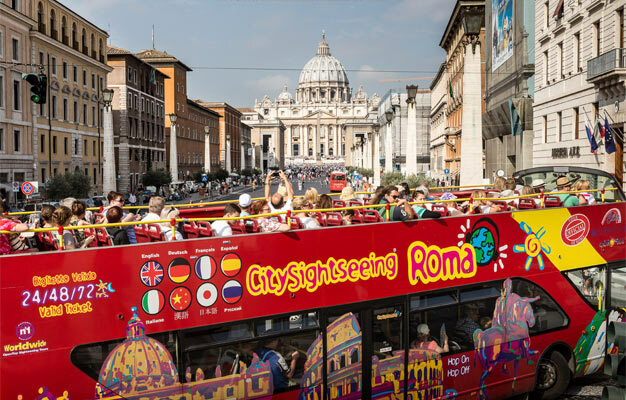 You can download the app Rome Sightseeing Experience onboard the bus, thanks to the Wi-Fi service, and listen to it when you want without the necessity of an internet connection. Choose one of your combo tickets and get 48 hours Hop-On Hop-Off + skip-the-line tickets to the Vatican Museums incl. the Sistine Chapel and/or the Colosseum. Soon after you have completed your booking your e-ticket will be sent directly to your email. Please print it out and bring it with you to the bus. 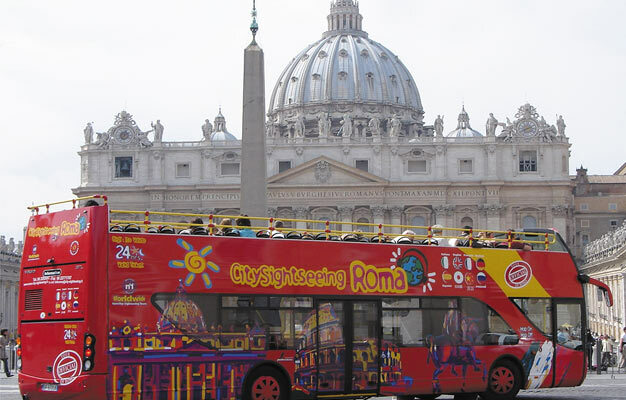 Exchange your e-ticket on board the City Sightseeing Roma bus or at one of the City Sightseeing Rome Visitor Centers. The tours last 100 minutes per tour. The buses run every 15-20 minutes depending on the season. Is there a dress code at the Vatican? Knees and shoulders must be covered at the Vatican Museums. - Large bags, backpacks and suitcases are not allowed in the Vatican Museums and Colosseum. There is a wardrobe at the Vatican Museums, but not at the Colosseum. - For security reasons, if there is a very large group of visitors when you arrive at the Colosseum you may be assigned an entrance time. You can explore the entire beautiful archaeological area that surrounds the Colosseum while you wait. The buses run from 9 AM until 5 PM (October to March) or until 7 PM (April to September).